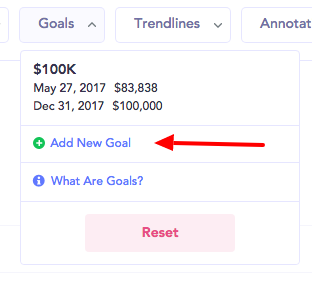 What is the Baremetrics Goals feature? Goals allows you to draw a separate line on any graph and see how your real numbers measure up. 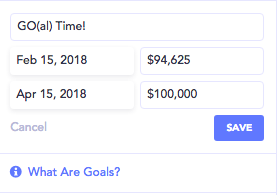 How do I add a goal? Click on the Goals button at the top right of the graph and choose "Add a Goal"
2. Give it a name, and set the beginning and end dates and values. 3. Your goal line will automatically appear, and you can see how well you're trending towards it. What sort of goals should I set? Use the Forecast tool to see where your MRR is headed. Want to speed up your growth? Set a goal for even higher than projected growth! If your churn rate is in the double-digits, your business is in trouble. Hit up our Academy article on churn, make some changes, and set a goal to reduce it!